Raytheon Company (RTN) develops integrated products, services, and solutions for defense and other government markets worldwide. It operates through five segments: Integrated Defense Systems (IDS); Intelligence, Information and Services (IIS); Missile Systems (MS); Space and Airborne Systems (SAS); and Forcepoint. Last week, the Board of Directors of Raytheon Company (RTN) increased the company's annual dividend payout rate by 8.8 percent, from $3.19 to $3.47 per share. "With today's announcement, we have increased our annual dividend for 14 consecutive years," said Thomas A. Kennedy, Raytheon Chairman and CEO. "The dividend increase is a key part of our capital deployment strategy, and reflects our confidence in the company's growth outlook and our continued focus on creating value for shareholders." 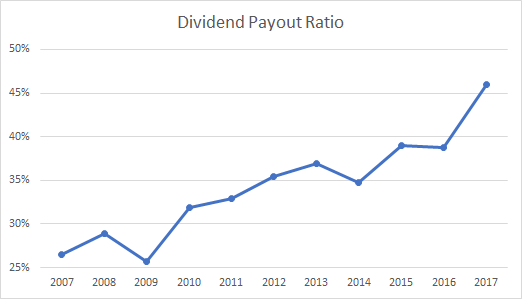 Over the past decade, this dividend achiever has managed to boost dividends at an annual rate of 12%/year. At a rate of 12%/year, dividends per share double every 6 years, using the rule of 72. The company managed to grow earnings per share at an annualized rate of 6.30%/year over the past decade. The company managed to boost earnings per share from $3.80 in 2007 to $6.94 in 2017. The 2018 earnings estimates are at $9.67/share. This sharp increase is thanks to a decrease in corporate tax rates for 2018, which will be a common theme in my analyses this year. Another driver behind those massive earnings per share gains were from stock buybacks. The number of shares outstanding decreased from 445 million in 2007 all the way down to 291 million in 2017. While I usually prefer dividends over buybacks, I have found that they work wonders when managers can retire shares at low valuations. Unfortunately, that is not usually the case in Corporate America. The reverse is usually true – companies tend to buy back shares at inflated valuations when they are flush with cash. However, when share prices are low, companies usually halt share buybacks. If valuations on Raytheon stock continue to be high, the effect of share buybacks would be more subdued over the next decade. I believe that defense companies will likely do well in the long run. The US will always need to spend money on defense. However, it may be best to own all of them, in order to diversify sector risk. Unfortunately, we cannot reduce the risk of budget cuts at the largest customer – the US Government. This is where having some additional sources of revenue can be helpful for defense contractors. Unless a program is under a multi-year contract, it could get canceled and take a hit to sales. In addition, the nature of getting contracts involved competitive bidding. Changes to contract rules could affect companies’ profits. In the case of Raytheon, the US government accounts for 2/3rds of sales. However, the company also tries to grow by tapping the international arms market and making strategic acquisitions. The latest budget deal, and the tone at the top in the current administration suggest that defense spending may actually be on the uptick. As a result, defense companies like Raytheon will finally be able to grow revenues, which should translate into some solid organic earnings per share growth. Raytheon has paid out a higher portion of earnings as dividends over the past decade. 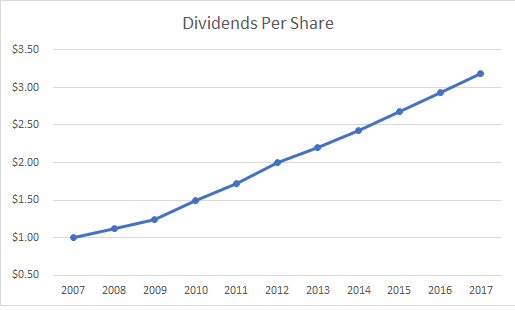 This is intuitive, as the annual growth in dividends is higher than annual growth in earnings per share. 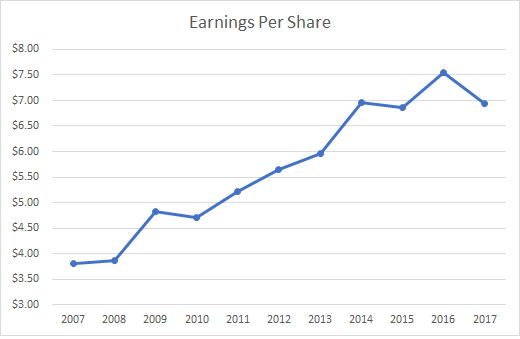 Using forward earnings of $9.67/share and the forward annual dividend of $3.47/share, the forward payout ratio is a very sustainable 36% today. While the company looks attractive, the valuation is a little bit high right now. Raytheon shares are overvalued at 22.10 times forward earnings. The stock yields 1.60%. The company may be worth a look under $193/share. - Should Dividend Investors be Defensive about these stocks?